Public lecture at Wesleyan University: What do mobile phones mobilize? What Do Mobile Phones Mobilize? In what sense are mobile phones, and related devices, mobile? Mobile phones, and mobile computing generally, facilitate particular kinds of mobility—especially elite, cosmopolitan, voluntary forms of movement and circulation—due in no small part to their user interface design. But what counts as movement, culturally speaking? How are mobile devices mobile in relation to the body? When are they characterized instead by locatability, for example, in relation to location-based services? 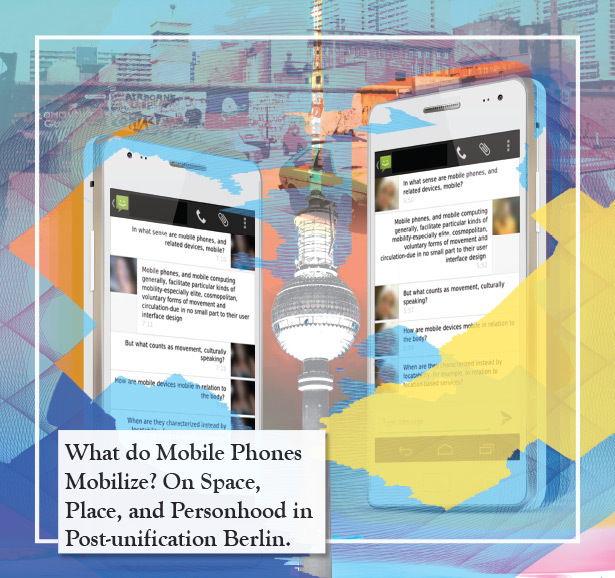 This talk takes up these questions to consider how circles of friends in Berlin interact with the interface design of mobile technologies, especially smartphones, which expect a singular, indivisible subject as the user. Everyday mobile phone practices often challenge implicit norms built in to mobile devices, with implications for sociality, mobility, and experiences of urban space. MONDAY, OCTOBER 13, 2014 | 6 P.M.
I’m very pleased to announce that I’m joining the Center for the Humanities at Wesleyan University this year as a Mellon Postdoctoral Fellow. This year’s theme is Mobilities, and I’ll be continuing my work on constructions of mobility and sociality in social and mobile media. I’ll be giving a public lecture on my research in October (details TBA). In addition, Angela VandenBroek and I have co-organized an invited session for the annual American Anthropological Association (AAA) meetings in December, in D.C., on technology, design, and inequality (Accidentally by Design: Producing Difference and Inequality Through Technological Designs). The session is being sponsored by CASTAC, through the General Anthropology Division. Ethics of User Experience Research: What anthropology can tell us about Facebook’s controversial study. Where is the line between industry user research and academic human subjects research? And what rights do—or should—users have over how their (our) data is used? As user research becomes an established part of technology design, questions of research ethics become even more pressing. Read more on the CASTAC Blog. Perils of Public Engagement: Are We All #engagedacademics Now? Perils of Public Engagement: Are We All #engagedacademics Now? My latest blog post for The CASTAC Blog, on some of the challenges of public engagement for academics, especially for scholars in anthro and STS. Welcome to my website! I’m an anthropologist and ethnographer studying media, technology, and place, especially mobile and social communications in European and transnational contexts. Find out more about my work and my background on the biography page, read about my current and upcoming research projects (soon to be updated), check out my CV, or take a look at some of my recent writings and publications. You can reach me at jordan@jordankraemer.com. Thanks for dropping by!